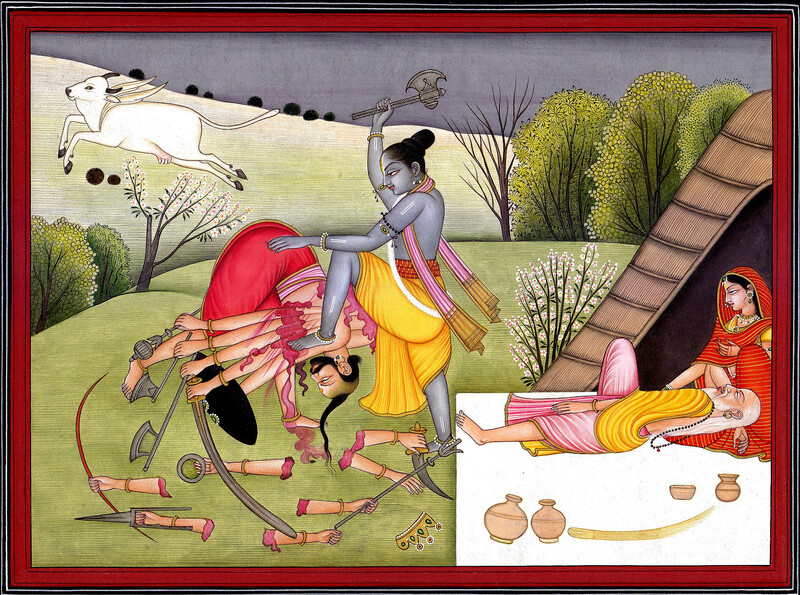 The miniature, conceived with a beautifully pastoral background comprising turfed hills, green trees covered with flowers and grass-thatched hut affording strange contrast, the characteristic idiom of the late eighteenth century Kangra paintings, represents Parashurama – Vishnu’s sixth incarnation, killing Kartaveerya, the thousand-armed atrocious Kshatriya king, for killing his father sage Jamdagni and forcibly taking away his divine cow Kamadhenu. Holding Kartaveerya’s head under his left foot the normal two-armed and fully composed Parashurama is severing Kartaveerya’s multi-arms with his ‘parashu’ – battle-axe. His severed arms, crown and all weapons lie scattered around and the atrocious king seems to have completely given up resistance. The winged white cow in the upper register and his father sage Jamdagni’s dead-body lying in his mother’s lap on the extreme left define the incident. In popular tradition Parashurama is known to get his name as Parashurama from his weapon ‘parashu’, one he battled with all-through his life and had the credit of destroying with it all Kshatriya kings twenty-one times. Unlike many other paintings that portray him as normal hued, this painting in brilliant Pahari art style represents him as blue-bodied, obviously for indicating his Vaishnava links. Kartaveerya, a Kshatriya king also known as Kartaveerya Arjuna, had obtained his one thousand arms by a boon from Lord Ganesh after his long rigorous penance dedicated to him. His one thousand arms gave him yet another name as Sahastrarjuna. As various Puranas have it, once upon a time there lived a great sage Jamdagni, one in the hierarchy of great Indian saints like Bharadwaj, Bhragu, Vashishtha among others. He had an illustrious son Parashurama whom gods had given their celestial cow Kamadhenu, the fulfiller of everything desired. 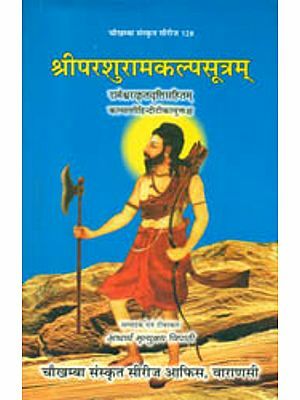 Once when leaving Kamadhenu in his father’s custody Parashurama was away for penance, Kartaveerya happened to visit the hermitage of Jamdagni. The sage summoned Kamadhenu to provide food for the king and his retinue and Kamadhenu did it. Astonished by the cow’s divine power Kartaveerya wished to take it with him. 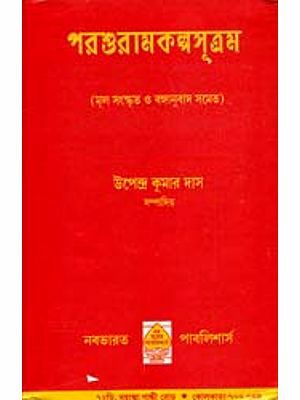 Jamdagni declined and opposed it, particularly as he was its mere custodian not entitled to give it to any one. However, the greedy king resorted to force and carried the cow forcibly to his kingdom. After Parashurama came back and heard about the misconduct of Kartaveerya, he decided to punish the king and destroy him for his misdeed. His father Jamdagni tried to cool him but he did not hear him. He argued that there would be no rule of law if the king himself began looting and acted against the holy ones. He sent a word of challenge to Kartaveerya but instead of returning his cow or apologizing for his misdeed he declared war against Parashurama. The worst as it was, to his utter disgust all Kshatriya kings rose against him and rallied behind Kartaveerya. 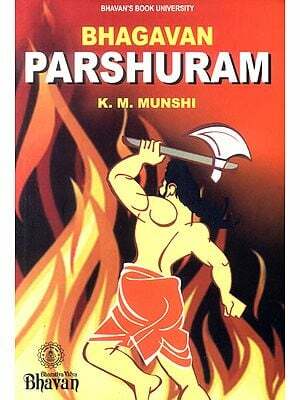 Thereupon Parashurama singly fought against them and destroyed all Kshatriya kings, Kartaveerya being the last. The enmity was deeper rooted. Generations after generations Kshatriya kings rose against Parashurama and each time he destroyed them. He destroyed them twenty-one times. It was finally in the form of Rama that the rule of law was restored and after Parashurama realised it he gave up his crusade against Kshatriya kings. Different from this Puranic position the popular tradition contends that while forcibly taking away Kamadhenu Kartaveerya also killed Jamdagni. By her divine powers his mother Renuka preserved her husband’s body till her son returned. After he came back she narrated to him the atrocities of Kartaveerya and commanded him to punish him. Parashurama not only defeated all Kartaveerya’s allies but also brought him to his mother and in fury for his misdeed cut all his wrong-doing hands before finally killing him. This is what most of the paintings, as this one, represent.